The German Shepherd Dog is arguably the most popular breed in the world. A medium to large sized animal, he was originally bred as a herding dog. However the breed was developed for use in the military and police during the first world war, as a guarding dog and their popularity remains today. The GSDs popularity derives from his temperament which should be steady and firm. His versatility knows no bounds and, due to his nature and trainability, he is prized by police forces around the world, as well as a guide dog for the blind and as an obedience expert. In short his temperament is deemed the most important single attribute of the GSD. That said there are breeders also striving for physical perfection within the breed. The GSD has a long coat that is relatively easy to maintain with regular grooming. The shepherd needs a firm and consistent owner as he is an intelligent animal who needs to be kept occupied to prevent him from becoming bored and mischievous. It is important not to treat him harshly as the breed can become insecure which in turn could lead to aggressive, fearful behaviour. 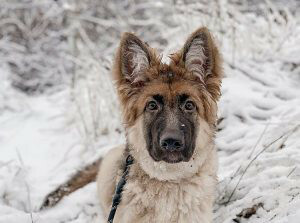 The GSD has a wolf like face and head, his ears are erect. His body is long and well muscled and his back is slightly curved with his hind quarters being lower than his front end. The breed is very prone to hip dysplasia and care should be taking when choosing a puppy that parents have been hip scored. The coat is long and can be black, cream, white or black and tan. He stands up to 65cm at the shoulder and can weigh up to 40kg. A loyal and intelligent breed the GSD has a life expectancy of up to 13 years old.